One of the best and easiest ways to reach Taipei Main Station from Taiwan Taoyuan International Airport (TPE) is by using Bus 1819. The journey, which takes about one hour, is inexpensive, comfortable, and perfect for travels in a group or with luggage. Taoyuan International Airport is located in the city of Taoyuan, about 25 miles (40 kilometers) west of central Taipei. The airport is the largest and busiest in Taiwan and is one of the busiest in the world. If you will be flying into Taiwan from an international point of origin, odds are you will land at Taoyuan Airport. The airport also serves as the main international hub of China Airlines and EVA Air. Nearby Taipei Songshan Airport handles most flights originating from Taiwan, China, Japan, and South Korea. If you board the bus at Terminal 2, the bus will make brief stops at Terminal 1, Taipei School for the Hearing Impaired, MRT Yuanshan Station (Kulun Street), Fortuna Hotel Taipei (Taini Building, Mackay Memorial Hospital), and The Ambassador Hotel before reaching Kuo-Kuang Bus Taipei Terminal. The bus terminal is adjacent to Taipei Main Station. This guide will focus on arriving at Terminal 2. If you arrive at Terminal 1, follow the signs for the bus to the city. The bus to the city is marked as 22 on the map above. After landing in Taiwan, you will first need to clear immigration and customs before entering the country. If you are a U.S. citizen or holding a foreign passport, you will need to complete an arrival card before passing through immigration. Arrival cards should be distributed to all passengers by flight attendants on your flight. Arrival cards are also available in the terminal before reaching immigration. After a long flight across the Pacific, the last thing you want to do is wait in a long line to clear immigration. In my experience, clearing immigration at Taoyuan International Airport takes around 20 to 30 minutes. The exact time will vary on what time you land, how many immigration counters are open, and how many other flights have landed around the same time. If you checked in any luggage for your flight, you will need to retrieve your luggage at baggage claim after passing through customs but before clearing immigration. Only have carry-on luggage? 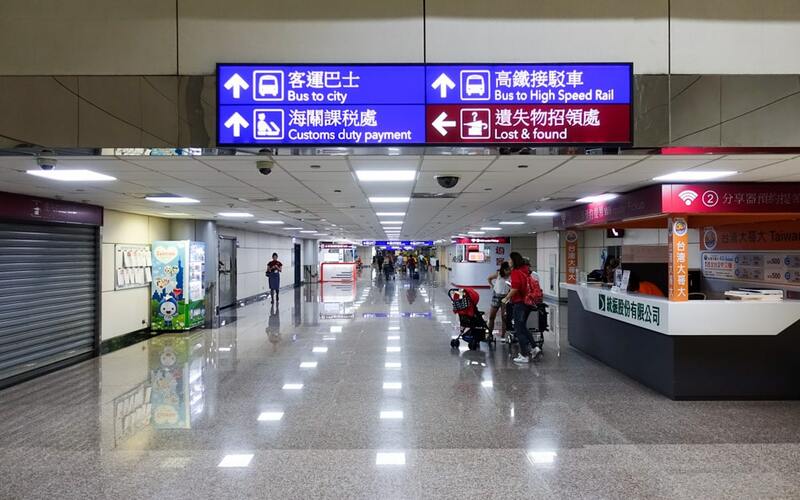 If so, you can proceed straight to the customs line near the exit to the arrivals hall. After clearing customs and immigration, you can now exit through the sliding doors into the arrivals hall of Terminal 2. As you exit, notice the sign indicating the bus to the city will be to the right. You have now waited in a long line to pass through immigration, collected your luggage from baggage claim, and passed through customs. You are now officially in Taiwan, and more specifically, the arrivals hall of Terminal 2 . To reach the bus station, follow the signs for bus to the city. If you get lost or have any questions about Taiwan, the airport, the bus, the Taoyuan Airport MRT, or anything else, then you can stop by the Tourist Service Center located just to the right after exiting from immigration and customs. The bus to the city is marked as 21 on the map above. Unless you have an EasyCard transportation card, you’re going to need cash to pay for your ticket for Bus 1819. If you need cash, you will find multiple ATM machines scattered across Terminal 2. If you will be using an international debit card, be sure to notify your bank about your international travel plans. If you fail to notify your bank, your card may be declined by the ATM machine. 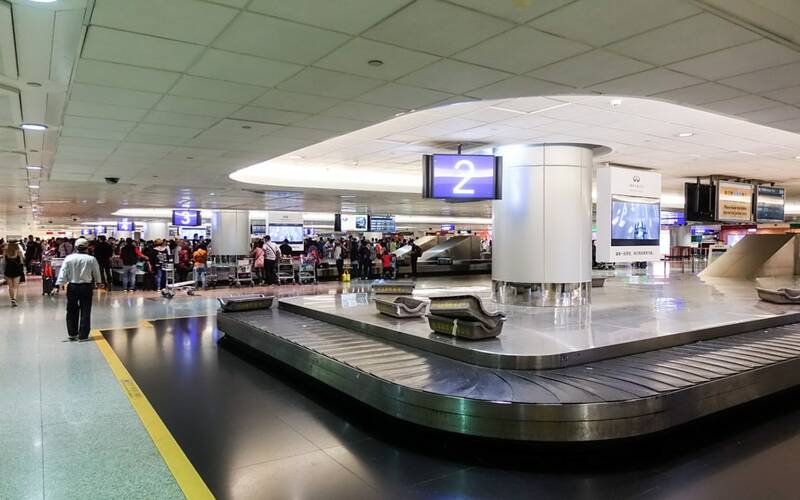 Foreign currency exchange counters are located near baggage claim before customs and inside the arrivals hall of Terminal 2 if you would rather convert your cash into New Taiwan dollars. When you reach the end of the terminal, continue down the walkway. Continue following the signs for the Bus to city. If you continue to follow the signs for Bus to city, you will find your way to the Terminal 2 bus station. It is here where you can buy bus tickets to Taipei and other destinations in Taiwan. Just outside the doors from here are the bus stops. Arriving on a late flight? No problem. Bus 1819 runs 24 hours a day between Taiwan Taoyuan International Airport and Kuo-Kuang Bus Taipei Terminal (Taipei Main Station). At the airport, the information board listed Bus 1819 as only running once per hour between 1:50 AM and 5:50 AM. Otherwise, the bus runs every 15 to 20 minutes. With that said, the Taiwan Bus website lists the bus as running every 15 to 20 mintues, 24 hours a day. Tickets for Bus 1819 can be purchased at Counter 2. The cost is NT$125 or about $4.13 for a single journey. Let the person at the counter know you would like a ticket for Bus 1819 and hand them at least NT$125. I paid with NT$200 and received change so you can expect to receive change. You can also purchase tickets when boarding the bus, but no change will be given. If you have an EasyCard transportation card, you do not need to buy a ticket at the counter for the bus. You can head straight towards the bus, swipe your EasyCard on the electronic reader, and board the bus. Those using an EasyCard will also receive a 20% discount compared to paying with cash. With ticket in hand, you can now head towards the bus. From the ticket counters, head to your right towards the exit for Bus parking bay 1-3. Out these doors is where you will find the stop for Bus 1819 and other buses. After exiting through the doors for Bus parking bay 1-3, just to your right will be Bay 3. Bay 3 will say Kuo-kuang – Bus 1819: Taipei Main Station and Bus 1843: Nangang Exhibition Center. This is where you will board Bus 1819. If you have any luggage, it will need to be stored in the cargo holds below the bus. Depending on your destination, the bus driver might ask you to place your luggage in one cargo hold or another. With ticket in hand and your luggage stored in the cargo holds, it’s now time to board Bus 1819 towards Taipei Main Station. On the bus, seats are first-come, first-serve. All seats are open with no assigned seats, so sit wherever you want. I was surprised just how comfortable the reclinable seats were. Even better, each seat featured a USB power connection and air conditioning vents above each pair of seats. If Taipei Main Station is your final destination, remain on the bus until the last stop. If Taipei Main Station is not your destination, pay attention to the bus alerts in both Chinese and English. Alerts will be given on the information board at the front of the bus and over the speakers. Make sure to press the stop button on the bus at your desired stop. About one hour after leaving Taiwan Taoyuan International Airport, Bus 1819 will arrive at Kuo-Kuang Bus Taipei Terminal, adjacent to Taipei Main Station. If you are facing the bus terminal, look to your left for the east entrances of Taipei Main Station. According to the schedule that was listed at the airport, after 1:50 the next bus should be at 2:30 then 3:20. According to the Taiwan Bus website, the buses continue to run every 15 to 20 minutes, even between 2:00 and 5:00. Please let me know your experience when you arrive in Taipei. I am curious to know which schedule is correct. I would assume the website information would be up to date but I can’t say for sure. Hi! We arrived in Taipei last week and I’d like to inform you that Bus 1819 runs every 15 minutes. We weren’t able to catch the 2:00AM bus as we’re getting through the exit doors, the next one came after 15 minutes. Fare now is ntd 140 at the counter. Thanks very helpful. I have 10 hrs in taipei on March 1st, so figured I would leave and go into the city to get some food at, Fu Hang Dou Jiang. I assume the buss was cheapest way ? How much was the train, and is it possible to get a sim card in airport ? So I can have some data and be able to use google maps ? So I know where im going. I have never taken the train, but according to the train website, the fare between the Airport Station and Taipei Main Station is NT$160. My phone does not have a SIM card reader, so I never purchase SIM cards, but I am sure the airport has them. I always rent a portable WiFi router through a website called Klook. Hi, thank you for the extremely detailed info! I’m arriving in late March with 10 high school students. I speak Chinese, and they speak a bit (they’re studying in school). We’re arriving at 5 am after a flight that leaves O’Hare at midnight, and I’m just trying to figure out whether we should take this bus, or go to Taoyuan to get on the MRT? We’re staying at the YMCA by the Taipei train station, so I think it will be easy enough to get to our hotel once we’re at the train station. Anyway, my reading tells me that the high speed rail is only 35 minutes, but it seems we have to take a bus to Taoyuan to catch it, whereas this hour-long bus ride leaves right from the airport. I’m also urging everyone to pack light for our short stay, but can’t be sure some won’t have more luggage. Based on the ease of moving a group of 11 with luggage, after a long flight when they’re likely tired, which do you think is the better option? Thanks so much in advance. I wish I could give you more information about the MRT but I still have yet to ride it. I will have to try it next trip and document it. If you are staying near the main station, maybe the bus is the best option. Good luck with all of those high school students. That sounds like an exciting, and stressful trip. A former student who lives there says both the train and bus are good options. It will be a great opportunity to have the kids work as a team and use some of their language skills from the get go. Thanks! Sorry for the late reply. As far as I know, tickets could only be purchased by cash at the airport bus station. I recommend stopping by the Tourist Service Center in the arrivals hall and asking them if credit cards can be used or if you can purchase a travel card with credit card. Please let know how it goes and I will update this post. Where and how can I purchase bus 1819 ticket in Taipei City in order to go to TaoYuan airport..? You can purchase a bus ticket to Taoyuan Airport at the Kuo-Kuang Bus Taipei Terminal which is located just outside Taipei Main Station. Hello! Do you know where to purchase the Easy Transport Card ? Can it also be used within the metro train station and convenience stores? You can purchase the EasyCard at MRT stations across Taipei along with major convenience stores such as 7-11. Most convenience stores accept EasyCard payments. From Taipei airport to Taipei main station, can the easycard be used or is it we got to purchase the bus ticket over the counter? If you have an EasyCard, you do not need to purchase a ticket over the counter. You may swipe your card when you board the bus as usual. I just need to top up my easycard and I just swipe it when I board the bus? Do I need to tap out when I alight as well? Hi, is it safe to travel from airport to taipei city at 2-3am? Is there a good place to go? Yes. While incidents can happen worldwide at any time, Taipei is a very safe city, even at night. I wouldn’t worry, just use common sense. THANKS FOR THE INFO. I HOPE WHEN WE USE THE EASY CARD FOR THE KIDS IT will CHARGE HALF THE PRICE (NT$65). WE WILL BE THERE THIS COMING JUNE 2019 (10 PAX). Yes, that is correct. I believe children under the age of 12 pay the half fare which would be NT$125. Enjoy your trip to Taiwan! Is a 4 year old child free on the Bus 1819 fare? I believe children under the age of 12 pay half fare which would be NT$65. Would you happen to know the travel time from Taoyuan Airport to Taipei Main Station by taking Bus 1819? Also, does the bus have wifi? We will be arriving at Terminal 1, I’m afraid that the seats of the bus are all taken when it stop at terminal 1, since its 1st stop is at terminal 2, should we travel to terminal 2 instead just to ensure our seats in the bus? Thank you for your response. I believe the bus took about one hour. I don’t remember if the bus had WiFi. I will have to check next time I am back in Taipei. I have taken Bus 1819 multiple times and never has it been full. While I can’t say for sure, I wouldn’t worry about finding a seat. Even if the bus is full, there will be another bus not far behind.